Persuade House Hlaalu that you are their Hortator. Meet with Crassius Curio in the Curio Manor, Vivec Hlaalu Plaza, to receive an overview of the Hlaalu councilors. Get Curio's vote for Hortator. Find Dram Bero hidden in the Haunted Manor, St. Olms, and get his vote. Learn about Orvas Dren from Dram Bero. Find Yngling Half-Troll in Vivec, St. Olms Plaza, Yngling Manor, and get his vote (gold required). Deal with Orvas Dren at Dren Plantation, north of Vivec. Find Velanda Omani in Omani Manor on Elmas Island, east of the St. Olms Canton, and get her vote. Find Nevena Ules in Ules Manor, just west of Suran (east of the Dren Plantation, and northeast of Vivec) and get her vote. Return to Curio to be named the Hortator of House Hlaalu. This quest is part of convincing each of the three Great Houses to name you their Hortator. The exact order you approach the houses in is not important. Again, you must visit all the council members of the House to convince them to vote for you. If you don't already have one, Nileno Dorvayn will supply you with a copy of the Yellow Book of 3E 426 which lists all the members, and for 50 drakes she will direct you to Crassius Curio. The members are: Crassius Curio, Yngling Half-Troll, Dram Bero, Nevana Ules, and Velanda Omani. Crassius Curio, downstairs in the Curio Manor in Vivec, Hlaalu Plaza, will support you for a little favor. If he likes you (70 disposition), he just wants a kiss. Otherwise, it's 500 gold for Hlaalu members, 1000 for non-members. Curio also has some good advice on the other council members. You get a +30 disposition increase if you kiss him, +10 if you give him the gold. Another option is to bribe him with 1000 gold (which will increase his disposition to 100) or a few 100's and then kiss him, bringing the price down and making him like you more. Dram Bero is hidden in the basement of the Haunted Manor in St. Olms Plaza. The basement door is locked (there are lockpicks under a table in the first room). You merely have to talk to him to get his vote. He'll mention that Velanda and Nevena are loyal to Orvas Dren, the brother of the Duke who has a large plantation in the Ascadian Isles (see below). Yngling Half-Troll is in Vivec, St. Olms Canton Plaza, Yngling Manor. He'll ask for 1000 gold if you're a member, or 2000 otherwise. An alternate route is to actually kill Yngling, which is quite alright with the other council members if you talk to them about it (such as Dram Bero). But beware; if you attack Yngling, everyone else in his house may come to his aid and help to finish you off. A good opportunity to kill him will provide itself during the Yngling's Ledger quest - refusing to give him the ledger will provoke an attack. Orvas lives on the Dren Plantation, a large manor north of Vivec. If your disposition is low when talking to him, he may attack; kill him quickly to avoid alerting the guards. There appears to be no way to show Dren's incriminating note to his brother, Duke Vedam Dren. Once Orvas is taken care of, you can continue and talk to Velanda and Nevena. Velanda is in Omani Manor on Elmas Island, east of the Vivec St. Olms Canton. Nevena is in Ules Manor, directly west of Suran's House of Earthly Delights (directly east of the Dren Plantation, and northeast of Vivec). The manor is surrounded by slaves (there is no key to free them). Once you talk to each of the two councilors about the Hlaalu Hortator, they hastily give you their vote. You can now return to Curio in Vivec to be officially named as House Hlaalu's Hortator and receive the Belt of the Hortator as proof. Although you don't have to talk to Nileno Dorvayn, her disposition increases by ten if you do. It drops by ten if you can't afford to buy a copy of the book from her. Telling Orvas Dren that you wish to become Hortator to defeat Dagoth Ur will cause him to attack you, saving you the trouble of fighting his bodyguards. You can start this quest before completing The Path of the Incarnate but will be unable to finish it, since there will be no Hlaalu Hortator topic in conversation. 50 Finishes quest Crassius Curio gave me the Belt of the Hortator, a token that shows I have been named Hortator of House Hlaalu by Hlaalu's councilors. When I have been declared Hortator of all three Houses, Redoran, Hlaalu, and Telvanni, I will have fulfilled the Fourth Trial of the Seven Visions of Seven Trials of the Incarnate. 1 I have been given a recent edition of the Yellow Book of Great House Hlaalu. It lists the current Hlaalu councilors and their residences. 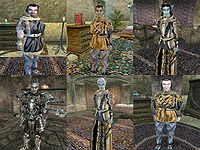 30 Nileno Dorvayn told me that I should speak with Crassius Curio at his manor in Vivec City. He is the most likely to consider my requests, whatever they may be. 5 Crassius Curio said that there were some hard feelings in House Hlaalu about the circumstances surrounding the death of a Hlaalu councilor. He expressed deep sorrow that he could not support me for Hortator without jeopardizing his own standing in House Hlaalu. 50 After I gave him a present of 500 gold, Crassius Curio gave me his vote for Hortator of House Hlaalu. 60 After I gave him a kiss, Crassius Curio gave me his vote for Hortator of House Hlaalu. 65 Upon receiving 1000 gold to cover expenses, Curio gave me his vote for Hortator of House Hlaalu. 5 When I asked if he would support my selection as Hortator for House Hlaalu, Dram Bero mentioned that he'd heard that I'd been involved in the death of a Hlaalu councilor. He said that would make it impossible for him to support me as Hlaalu Hortator. 50 Dram Bero was impressed that I had found his home. He agreed to name me Hortator, and gave me some advice. Yngling Half-Troll can be bribed or killed, and Crassius Curio might be manipulated. But Velanda Omani and Nevena Ules will not support me as Hortator without Orvas Dren's approval. 5 Yngling Half-Troll laughed when I asked him if he would support me for Hortator of House Redoran [sic]. He seemed to feel that killing a Hlaalu councilor ruined my chances. 10 Yngling Half-Troll told me that he wouldn't name me Hortator without a bribe of 1000 gold. 20 Yngling Half-Troll told me that he wouldn't name me Hortator without a bribe of 2000 gold. 50 After a hefty bribe, Yngling Half-Troll gave me his vote for Hortator of House Hlaalu. 70 I have killed the Hlaalu councilor Yngling Half-Troll. 50 Orvas Dren agreed to use his influence with Nevena Ules and Velanda Omani to have me named Hlaalu Hortator. 5 Velanda Omani expressed great concern that she heard that I'd been involved in the death of a Hlaalu councilor. Under the circumstances, she could see no chance of my being confirmed as Hortator. 20 Velanda Omani told me she would not name me Hortator without the approval of Orvas Dren. 50 When I asked that Velanda Omani name me Hortator of House Hlaalu, she agreed immediately. She seemed very anxious to please me. Now I have her vote for Hlaalu Hortator. 5 Nevena Ules mentioned the unfortunate coincidence of my request to be named Hortator of House Hlaalu and my implication in the untimely death of a Hlaalu councilor. Her opinion was that consideration of my request would be postponed indefinitely. 20 Nevena Ules did not seem to understand what I was asking. She told me I should meet with one of her advisors, Orvas Dren. 50 Nevena Ules seemed very nervous when I asked her to confirm me as Hortator of House Hlaalu. She agreed immediately, and seemed very anxious to please me. Now I have her vote for Hlaalu Hortator. This page was last modified on 15 July 2018, at 23:20.